Barefoot and minimalist running have been suggested to be better on the body and induce less injuries, but that's not the only reason to go away from traditional running. Running either barefoot or in a minimalist shoe feels great! You feel free and energized, like you're floating along on your run, uninhibited by the ground on which you tread. Plus, they can provide great gains in strength and speed, making you the strongest, quickest runner you can be. heel-strike style of running to as far along the minimalist scale as you'd like to go. Progression is always at your own pace and what you're comfortable with! I have broken up this guide into three phases: 1) Preventative Measures, 2) Your Next Steps and 3) The Final Steps to Minimalism. Each phase includes how-to's and helpful advice to make your transition as seamless as possible. 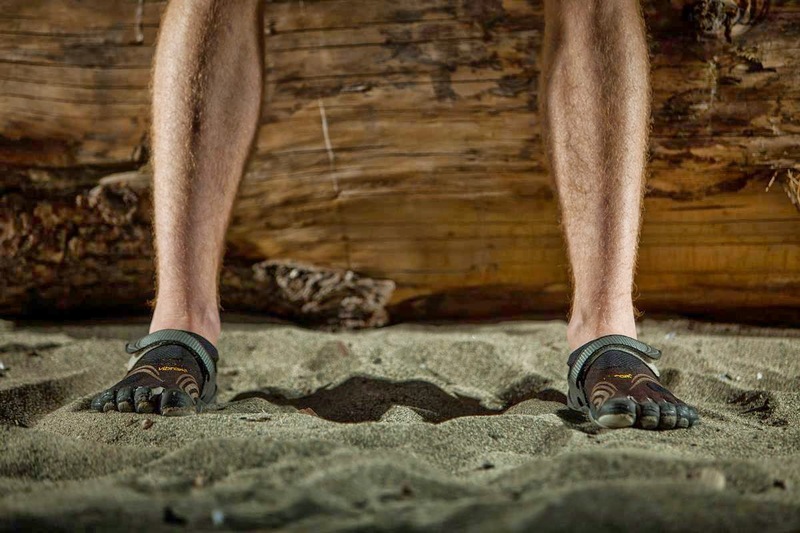 Cautionary piece before I start: I am not an expert in barefoot or minimalist running, so this post is based solely on my experiences running in vibram five fingers and minimalist shoes over the last few years. Take from it what you will, but know that you may have different results. The form and style of minimalist running is obviously different from that of traditional shod running. Runners tend to land somewhere between mid-foot and fore-foot, absorbing the impact using their muscles, especially their calves! Traditional running involves landing on the heel and absorbing impact using mainly the material of the shoe, with some contribution from the muscles. By landing on the fore/mid-foot, greater energy can be stored in the tendons and muscles, and that can increase the efficiency of running. Another important difference is that cadence, or leg turnover rate, is typically higher in minimalist runners. This helps reduce the loads on the foot and muscles thereby reducing injuries. Also, by increasing cadence, it becomes quite difficult to over-stride and cause damage to the foot from an improper landing. Increases in cadence can also increase efficiency of running. Metatarsal stress fractures involve forces being repeatedly applied to the bones of the foot above and beyond what the bones are adapted to. This is usually associated with a sudden switch to barefoot/minimalist running or a rapid increase in the time or distance ran in that style. This common running injury can be avoided by gradually switching from shod to minimalist running using proper form in which the runner is light on their feet. This allows the bones to strengthen and adapt to the new forces and encourages the newly strengthened muscles to absorb the load instead. Another possible cause is from stepping on a rock with significant force while running. This is also the result of bad form as the runner is not staying light on their feet with quick leg turnover. Achilles tendonitis and Achilles strains are also quite common. These sorts of conditions result from abrupt increases in activity without adequate recovery or stretching. The best approach to these conditions is prevention: undertake changes to your activities gradually, slowly developing the time/distance you run with a minimalist/barefoot style. So with all this "increase-too-quickly-get-some-scary-injury" talk, what should you do? Strengthening exercises, that's what! By starting to strengthen the muscles of the foot and calf, before even changing your running style, you can help avoid some injuries, and make the transition that much more seamless. Here's two exercises that can help prepare you to run barefoot/minimalist. the Achilles tendon for the stresses of running with a fore-foot strike. This exercise involves raising and more importantly lowering the body using the calf muscles and can be done on a stair or a stool that is close to a wall or counter for support. Towel pulls can help strengthen the muscles of the foot and ankle, thus helping protect the bones in the foot by absorbing the impact upon foot strike. To do these get a small towel (hand towel works great) and lay it on the ground in front of you. While keeping your heel still, use your toes to grab and pull in the towel toward your heel. Lay the towel back out (use your feet if you can! ), switch feet and repeat. Ideally you should do these exercises for a few weeks before taking on the next steps in your switch to minimalist running. Over this time, increase the time or number of reps that you do, allowing adequate recovery time and stretching between sessions. Take Home Message: The saying "an ounce of prevention is worth a pound of cure" holds true for minimalist running! Prepare your muscles and your mind to make your transition easier! Phase 2 of this guide will be posted soon, stay tuned!